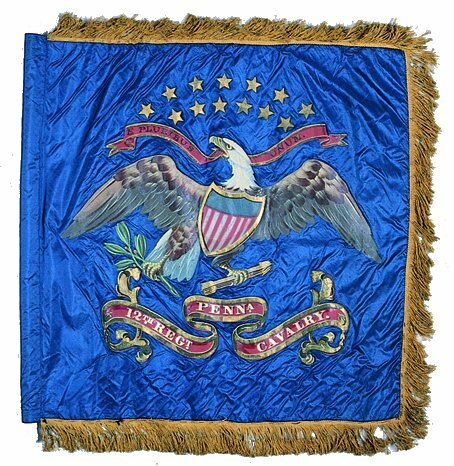 The 12th cavalry, 113th regiment was composed of soldiers from more than 14 counties spread across the Commonwealth of Pennsylvania. It was organized in Philadelphia in November of 1861 and moved to Washington, D.C. in April, 1862. During the battle of 2nd Manassas, the regiment lost more than 260 men, who were captured when the regiment engaged General A. P. Hill's division at dark on August 27th. The 12th Cavalry saw action in the Antietam campaign and was assigned guard duty on a section of the B&O railroad. It fought at Winchester in June of 1863, losing another 172 troopers, most of whom were captured. The regiment participated in some of the smaller engagements during Lee's retreat from Gettysburg and was assigned to guard duty in the northern Shenandoah, before re-enlisting and going home on furlough. The regiment fought with Jubal Early's Confederates as they threatened Washington and assisted with the opening engagements of Sheridan's Valley Campaign. The regiment was then sent to Charleston, West Virginia to obtain fresh horses and it remained there on guard duty until the end of the war. Source: Richard A. Sauers, Advance the Colors: Pennsylvania Civil War Battle Flags Vol. II (Harrisburg: Capitol Preservation Committee, 1991, 375.